This is for you gals out there who don't think you can do DIY. 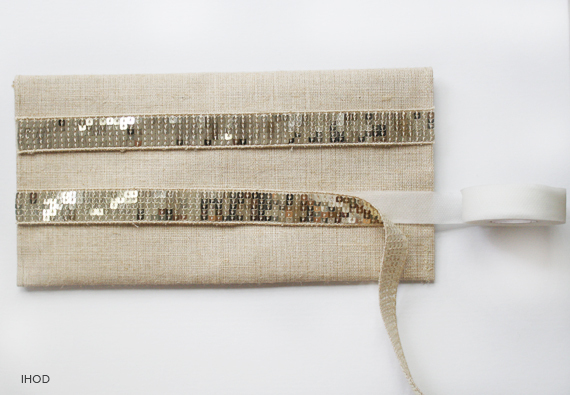 These fun and fancy clutches only involve THREE items and THREE steps. Not kidding! Ready? First things first, if you are near a Hobby Lobby, RUN your little bottom over there and pick yourself up one or two of these dandy linen clutches. They are ripe for the picking at only $3.99! And use their weekly 40% off an item coupon to get it for less than $2.50! If you are not near one, never fear! You can buy one online here or here. They have both colors available. I bought both the dark charcoal grey and the natural linen. Then head over to the ribbon and trims section and pick out a fun trim to embellish them in. 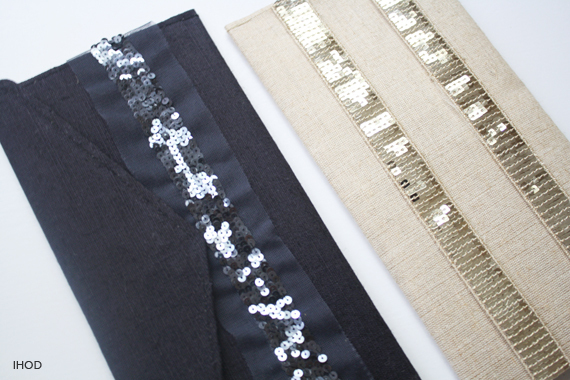 I picked up this gold sequin trim (they usually have trim on sale for 50% off) for $2.50. Sorry the Charcoal trim I bought in the LA fabric district for my shop, so I already had that in stock. For the adhesive you can use hem tape OR glue gun. Easy as that! 3)Place hem tape between trim and clutch, and hold down your iron on the INSIDE of the clutch for a few seconds on each section of the trim to get them to stick together. 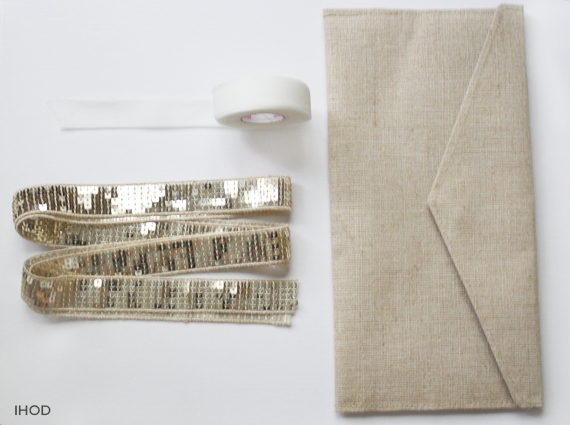 3) Simply heat up your glue gun and use small amounts along the trim where you would like it placed. 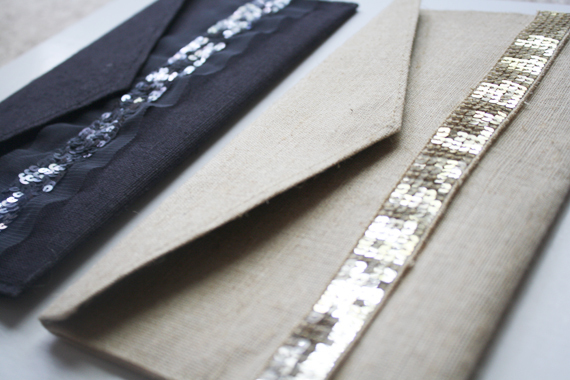 *You can use one or two strips of trim on the back depending on the look you want. 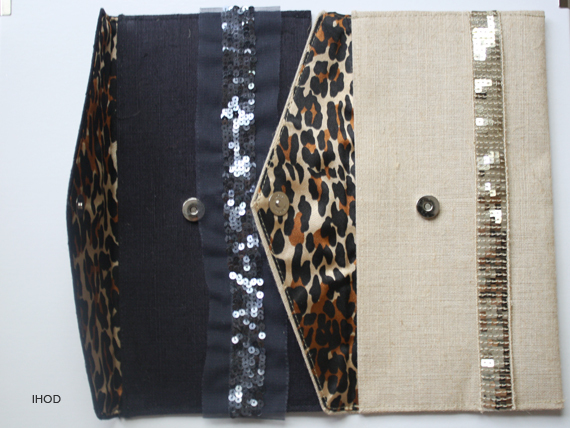 I hope you go treat yourself or a friend to this $5.00 glam clutch! And if you do, you will have to share the pics and let me know how it goes! Also, I shared some fun maxi skirt love over on Mrs. Capretta's blog if you want to come visit! What a great little project! I used to live near a Hobby Lobby, but have since moved far, far away. Oh, how I miss it! I checked online for the clutch, but unfortunately, the linen color is sold out right now. I will be filing this project away for something to do in the near future! I love this idea! Thanks for sharing - my friend and I were trying to figure out how you made this in your last outfit post! So stylish and cute - must remember this for Christmas! You are one styling, savvy lady darling! I wish i had a Hobby lobby here! Of course we don't have a hobby lobby anywhere near us. But I want that linen one, so cute! Great DIY! Um, I seriously think this is the easiest DIY I've seen...and I love the end result! SO simple, I think I can do this!! 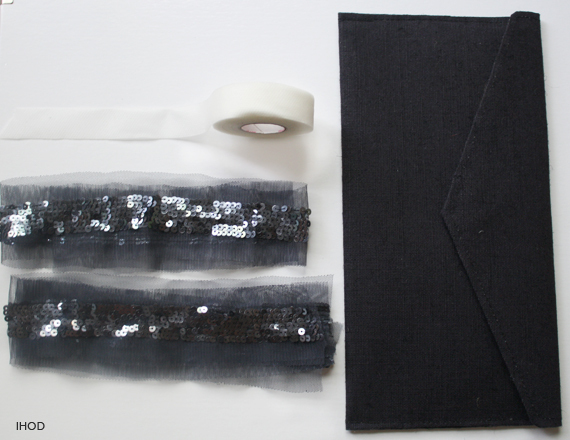 Love any DIY that involves sequins and sparkles. How easy is that?! Love them!! and how fun is the leopard print inside!! I'm thinking of making one for my stylish bff in NYC! ;) Thanks for the instructions!! Such a great idea, so chic and elegant but yet more than affordable! WHAT!!! This is a GREAT DIY!!!!! Oooo! I wish their was a hobby lobby near me!!! Great DIY! 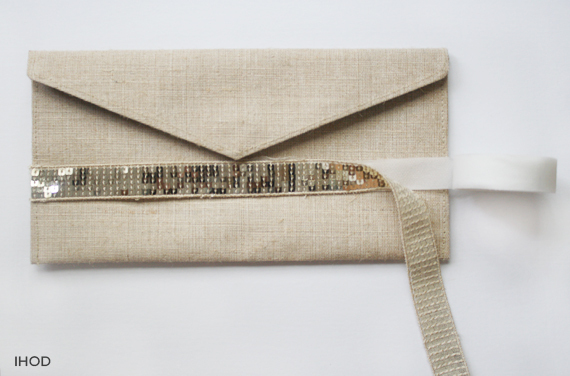 Love it - love clutches....they are timeless. I am still in shock that they have those cute little clutches for $3.99 at my favorite place! The sequins add that perfect little touch to make them all fancy-pants (c: Brilliant! These are so fun! Glitter and leopard are a great combo! I'll be adding this to the list of things I need to do. Sooo sweet and chic! I love it and the price tag too! I wish we had Hobby Lobbies! Great, and very simple DIY! How can you NOT try it? what a great diy! thanks for sharing the details, i'm definitely going to try it. I'm so running my little bottom over to Hobby Lobby tomorrow! And so glad to discover hem tape. Who knew?! Cute!!! And easy - the best! GREAT idea!!! And easy:) I am thinking extra C'mas gifts for teachers, or cousins!! These are totally gorgeous. I am so happy to have found your blog - devouring it!